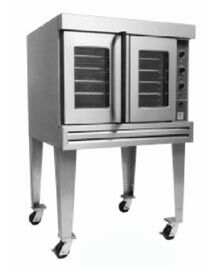 Bakers Pride Gas Convection Oven BCO-G1- Bakers Pride Cyclone series convection ovens provide the perfect combination of versatility, precision, and productivity demanded by professional chefs and bakers all over the world. From Gentle baking to high volume roasting to large production, Bakers Pride convection ovens deliver consistent reliability and superior performance time after time. Features rotary controls, 60 min. timer, 2-speed motor, stainless steel independent doors with double pane thermal glass, (5) racks with 11 positions, stainless steel top, front and sides, 32" painted legs, 60,000 BTU. UL listed.